ONE of the most prosperous centres in the United Kingdom is the Port of Bristol, which includes docks in the heart of the city and at Avonmouth and Portishead. Bristol has a population of 400,000, and thirty million people live within a radius of 150 miles from the port. It is linked by roads, railways and inland waterways with the Midlands, the West of England and London. Trade with the Dominions and foreign countries is maintained by ships which dock at Avonmouth and Portishead; coasting vessels and small ships from overseas berth in the City Docks. About 4,000,000 tons of merchandise, including over 6,000,000 bunches of bananas, pass over the quays annually. Bristol is a great tobacco port, and the Customs dues amount to about £25,000,000 a year on tobacco alone. The Port Authority’s three bonded warehouses are familiar land-marks, and have a total capacity of more than 35,000 casks. Other bonded warehouses bring the total capacity to over 100,000 casks. Bristol has always been associated with famous tobacco firms. Grain, metals, petroleum, petrol, provisions and timber are among the more important of a wide variety of cargoes landed in the port. The docks are owned by the Corporation of Bristol, and are administered by a committee under the title of “The Port of Bristol Authority”. The area of the port is considerable. On the way up the Bristol Channel the first dock is at Portishead, on the Somerset shore of the River Avon, the docks at Avonmouth being on the Gloucestershire side of the river. The City Docks are seven miles from the sea up the River Avon. 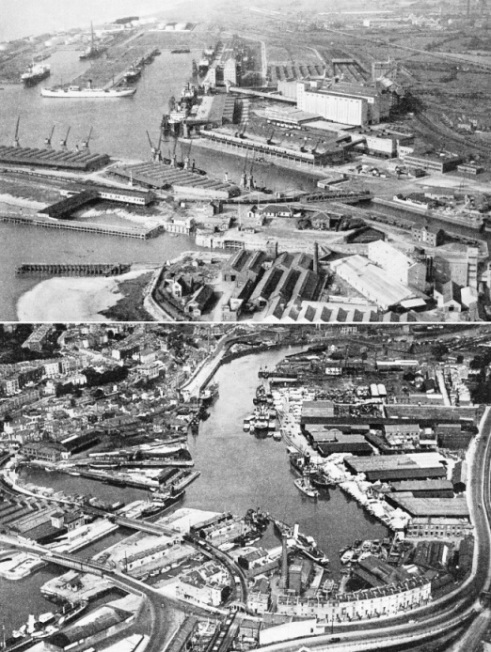 The Avonmouth Dock and the Portishead Dock were built by private companies and were opened in 1877 and 1879 respectively. At that time the Corporation was involved in a long controversy over the question of whether new docks should be built along the River Avon or at the river mouth to be entered direct from the Bristol Channel. While the City Council was debating the question these two docks were built and for a time there was a ruinous rate-cutting war between the Corporation, as owners of the City Docks, and the private companies controlling the docks at the entrance to the River Avon. This ended in 1884 when the Corporation acquired the docks at Avonmouth and Portishead. Ships continued to increase in size and it became imperative that further improvements should be carried out if the port was to maintain and extend its trade. At last the Corporation determined in favour of expansion at Avonmouth. In 1901 Parliamentary powers were obtained and work on a new dock at Avonmouth was begun. This dock, named the Royal Edward Dock, was opened by His Majesty King Edward VII in July 1908. The Entrance Lock to the Royal Edward Dock is 875 feet long and 100 feet wide, with a depth of water on the sill of 46 feet at high water ordinary spring tides. The entrance channel leads in between the North and South Piers. Before long it was again apparent that extensions were needed, but the intervention of the war of 1914-18 led to the postponement of large works. 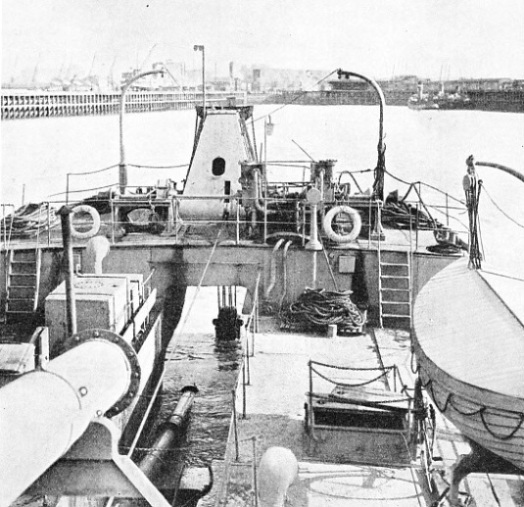 At the end of the war new schemes were put in hand and the Western Arm of the Royal Edward Dock now devoted to the oil trade, was built, and much was done to add to the equipment of the dock. The Royal Edward Cold Store, with a capacity of 500,000 cubic feet, was built and new granaries, warehouses and transit sheds were erected. The next important development was the building of the Eastern Arm of the Royal Edward Dock, which is 1,700 feet long and 400 feet wide. This extension was opened in May 1928 by His Majesty King Edward VIII, when Prince of Wales. With these extensions the Royal Edward Dock has a total water area of sixty-three acres. The length of the dock is 3,572 feet, and its width 1,000 feet. The total length of the quays is 10,130 feet. The eastern side of the Eastern Arm extension is typical of a modern lay-out of a quay with equipment for the rapid handling of many kinds of goods. Two transit sheds, of triple floor construction, 500 feet long and 156 feet wide, and a transit granary with a capacity of 12,000 tons, are the principal features. The buildings are of reinforced concrete and have been built on the quay-side. The transit sheds are fitted with electric travelling roof cranes, those on the water-side having particularly long jibs to facilitate the discharge of vessels and the placing of cargo either direct to railway trucks or to shed. Cranes on the land side have shorter jibs and are used for loading goods stored in the transit sheds into road or railway vehicles. Electric lifts are provided for carrying goods from floor to floor within the sheds. Particular attention has been paid to the lay-out of the railway tracks provided for the dispatch of goods to and from these transit sheds. The lines are so arranged that shunting operations from each shed can be carried out independently. A complete system of electric capstans facilitates the moving of railway stock. The transit granary is the centre of the elaborate system of grain-handling equipment. It is divided into two wings with covered accommodation for railway trucks running between them. The eastern wing and the land side of the western wing are arranged for the delivery of bagged grain into railway trucks. Deliveries of grain to road vehicles are made from the east wing, and on the water-side of the west wing provision is made for the rapid delivery of bagged grain to coasting or canal craft as well as for loading craft with bulk grain by weighers and telescopic band conveyers. Berths regularly used for the discharge of bulk grain are fitted with travelling belt conveyers connecting with the storage granaries. Bulk grain is rapidly discharged by floating and shore pneumatic elevators which can simultaneously discharge grain on to the conveyer bands and direct overside to craft. 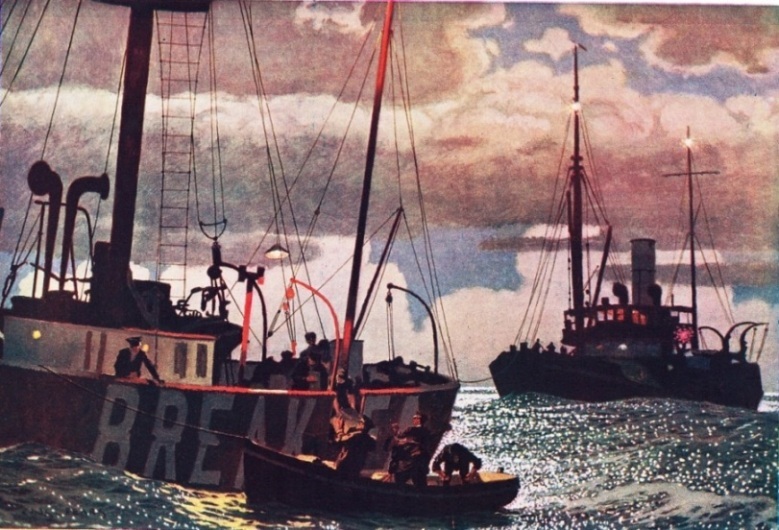 THE BREAKSEA LIGHTSHIP IN THE BRISTOL CHANNEL is the subject of this arresting picture by Charles Pears, ROI. The artist has illustrated a most important event in the life to the men who operate the lightship - relief and provisions being brought on board from a Trinity House tender. The Breaksea lightship is well known to navigators in the Bristol Channel. She has a red hull and carries a ball at her masthead. Her light shows one white flash every fifteen seconds and is visible at a distance of eleven miles. Her fog siren when in operation gives one blast of two and a half seconds every twenty seconds. Her submarine fog bell gives three quick strokes followed by an interval of ten seconds. The lightship’s position is lat. 51° 20’ N, long. 3°18’ W, off the Glamorganshire coast. At the Avonmouth Docks there are four modern granaries owned by the Port Authority and built on the silo principle. Grain is automatically weighed before being stored in the silos, and for delivery to rail or road vehicles it is sacked off from the mouth of the silos after having passed through automatic weighers. Storage for more than 250,000 tons of grain is available at the port. In recent years the Authority has taken a prominent part in the decentralization of imports of frozen meat and dairy produce. Imports have increased remarkably, particularly from New Zealand. This traffic is handled at a berth in the Royal Edward Dock. Adjacent to the berth is the Cold Store, which is connected to a quay-side transit shed by two overhead conveyer galleries. The meat or dairy produce intended for warehousing in the Cold Store is discharged by one or more of the electric roof cranes on the transit shed, and is lowered direct to the first floor of that shed. From there the produce is conveyed on trolleys through the conveyer galleries to the top floor of the Cold Store and thence by electric lifts to the various cold storage rooms. This method of dealing with the traffic entails an absolute minimum of handling which is essential for this class of traffic. For subsequent redelivery of goods from the Cold Store ample rail and road accommodation under cover is provided. Bristol was one of the earliest ports to be associated with the oil trade, and now about 100 acres of land adjoining the Western Arm have been set aside for the development of this trade. There are three berths for the accommodation of ocean-going tankers and two others for the loading or discharging of coasting and canal craft. The principal oil companies are all established at the Oil Basin and their installations are connected by pipe lines to the discharging berths. The Port Authority has provided a pumping plant for supplying steam to pump oil to and from the ship and the storage installations. Adjoining the Entrance Lock to the Royal Edward Dock is a passenger station, with Customs Offices and all necessary facilities. Embarkation and disembarkation take place immediately alongside this railway station and special boat trains connect with the principal main-line stations. The P. & O. Liner Strathnaver, 22,283 tons gross, docked at Avonmouth during the 1935 cruising season and the arrangements for berthing and accommodating the passengers were entirely satisfactory. Another vessel of the same fleet, the Strathmore, arrived at Avonmouth during the summer of 1936. Bristol is one of the principal ports in Europe for the importation of bananas, and about one-quarter of the total quantity consumed in England is handled at Avonmouth. The Port Authority and Elders and Fyffes have done much to develop the trade with Central America and the West Indies. Operations began with a small fleet of steamers of comparatively low tonnage in the early years of this century. The first vessel to arrive was the steamship Port Morant, and in 1901 a total of about 600,000 bunches was landed at the port. The annual quantity now handled at the port is more than 6,000,000 bunches of bananas. The modern fleet of liners operated by Elders and Fyffes maintain regular sailings to and from Bristol. A weekly arrival and dispatch is maintained, with additional sailings during the season. A special berth is allocated for the banana trade. The bananas are discharged from the ship by specially designed conveyers in which the bananas are carried on to the dock in slings. The conveyers carry the fruit from the hold of the vessel to travelling bands on the quay, from which the bananas are loaded direct to the railway vans. The lay-out of the railway lines is such that a plentiful supply of railway vans is moved more or less continuously alongside the conveyer bands. In this way the loading of the railway vans keeps pace with the rapid discharge of the fruit by the conveyers. The Royal Edward Graving Dock is owned by the Port Authority. It has a length of 875 feet, is 100 feet wide at the entrance, and has a depth of 32 feet of water on the sill. Several well-known firms have workshops alongside the Dry Dock and carry out all necessary repairs and refitments. A striking feature of the more recent development of the port has been the rapid increase in the number of flour and provender mills. These factories are mostly established at the Avonmouth Dock, which is now almost wholly given over to the tenants of the Port Authority. At this dock alone there are six mills connected with flour milling and the production of cattle foods, an installation for the storage of molasses in bulk and the equipment for dealing with cargoes of bananas. DREDGING OPERATIONS are an important feature of the work of all large ports, and for this purpose the Corporation of Bristol owns seven dredgers. The twin-screw bow well suction dredger Severn is seen at work at Avonmouth. Built in 1919, the Severn has a gross tonnage of 992, and pumps liquid mud at the rate of 100 tons a minute. The establishment of these industries at the docks is a tribute to Bristol’s pre-eminence as a distributing centre, particularly for the West of England, South Wales and a large part of the industrial Midlands. The Severn waterway, connecting with the Midlands canal system, provides inland water transport for a large area, and a network of arterial roads gives ready access to all parts of the country. The port is served by the Great Western and London, Midland and Scottish Railways. The railway lines on the Docks Estate are owned and worked by the Port Authority and all the berths have ample railway facilities. One of Bristol's advantages is the number of steamship companies which maintain regular liner services to and from overseas ports. 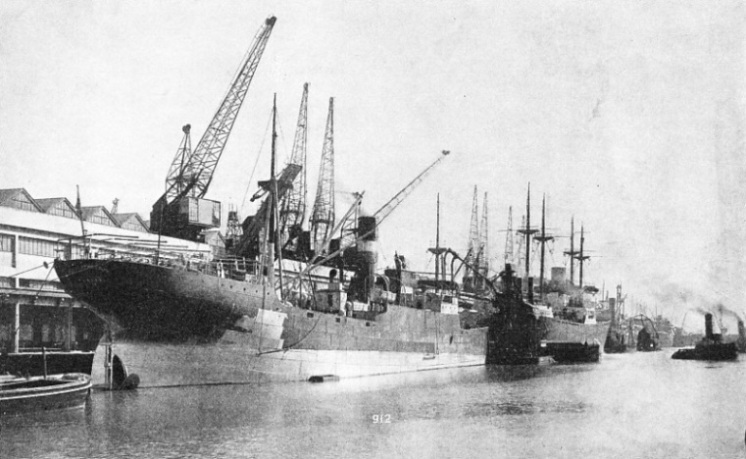 The Bibby, Henderson, Ellerman, Harrison, and Brocklebank Lines trade with Rangoon, Colombo, Calcutta, and other ports in the Far East. The Clan, Ellerman, Harrison, and Houston Lines serve South and East Africa, and the Elder Dempster Line connects with West Africa. From Australia and New Zealand the principal lines are the Federal, Shaw Savill and Albion, Port, Scottish Shire, Ellerman, Bucknall, New Zealand Shipping Company and Blue Star. THE PORT OF BRISTOL includes the docks at Avonmouth and Portishead as well as the docks in the City of Bristol itself, seven miles up the River Avon. About 4,000,000 tons of merchandise are handled in the port every year and about 6,000,000 bunches of bananas are discharged annually at Avonmouth. concentrates and whole cargoes of grain. The Isthmian Line maintains a frequent service to and from the Pacific Coast ports of Canada and the United States, and other steamship lines run services to and from the United States. Trade with Canada is maintained by two steamship lines from the Port: the Cunard Donaldson Line and the Bristol City Line. Trade with European ports is centred at the City Docks. Regular services are operated to and from Norway and Sweden, Danzig and other Baltic ports, Hamburg, Rotterdam, Amsterdam, Antwerp, Dunkirk, Havre and Italian and Sicilian ports. The Bristol Channel Levant Line trades with the Levant and Egypt. The way to the City Docks seven miles up the River Avon is a stretch of tidal water unsurpassed for scenery by few estuaries in England. The swift tides have cut little basins out of the banks and these tiny inlets are called “pills”. The largest is at the village of Pill, which was originally called Crockern Pill. This picturesque little place was once famous for the Bristol Channel pilot cutters, now displaced by steam. The sailing cutters were noted for seaworthiness and ease of handling in bad weather, and when they were superseded they were bought by yachtsmen who converted them into ocean-going yachts. Pill lies on the Somerset side of the river. A ferry service of rowing boats connects with Shirehampton, on the other side. Years ago Pill was the carousing place for the sailors and near-pirates of the vessels which moored in Hung Road, the reach of the Avon just above it. A rascal named Morgan built a village of taverns in the seventeenth century and catered for the sailors to such effect that the place became notorious. A small inlet below it is called Morgan’s Pill after this lawless man. Above Hung Road, where, in the old days, vessels could lie afloat even at low tide, the river sweeps round the appropriately named Horseshoe Bend to Sea Mills, below the Avon Gorge, and the site of one of Bristol’s early dock schemes. It was thought that a dock at Sea Mills would be of great assistance, as vessels could avoid the Avon Gorge, always difficult for sailing ships to negotiate. A dock, the third wet dock built in England, was built early in the eighteenth century and was not a success, although whaling ships used it for some years. THE ROYAL EDWARD DOCK at Avonmouth. The two extensions the Western Arm and the Eastern Arm, are seen in the top left-hand corner. The Western Arm is devoted exclusively to the oil trade, being nearer to the Bristol Channel. The large block of buildings in the centre is part of the Authority’s elaborate grain-handling system. The cold stores connected with the transit shed by two conveyer galleries are adjacent to the granaries. IN THE HEART OF THE CITY are the Bristol City Docks. On the left foreground is the entrance from the Cumberland Basin and adjacent are timber wharves. The total area of the City Docks is 181 acres, 83 acres being water. Above Sea Mills vessels pass through the Avon Gorge, which is spanned by the Clifton Suspension Bridge. To stand either on the lofty bridge or on the road below it round about high water when the ships are steaming to and from the City Docks is to enjoy one of the most picturesque scenes in Great Britain. From the road looking towards the sea towering cliffs rear skyward on either bank, with the beautiful Leigh Woods crowning the heights of the western bank. The graceful lines of the Suspension Bridge delight the eye. Below it the ships steam towards what appears to be an impassable barrier of rock, yet vessels up to 325 feet in length navigate the river to the City Docks. Just above the gorge are the City Docks and the hub of Bristol. When the docks were built in the beginning of the nineteenth century a new channel, called the New Cut, was dug for the Avon, and three miles of tidal river to the north of this were converted into the floating Harbour, or City Docks. The Feeder Canal connects the eastern side of the docks with the upper part of the Avon and affords a waterway to Bath and other towns. On the western or seaward side of the docks the entrance lock leads into the Cumberland Basin. The depth of water on the sill is 33 feet at high water ordinary spring tides. The length of the lock is 350 feet, the width 62 feet and the length of quayage 19,200 feet. This lock is at the junction with the New Cut, which is not locked and is tidal. There is a gridiron on the tidal side of the lock and a heave-up slip in the harbour; both belong to the Authority. There are also two dry docks. Port engineering in Bristol goes back for over seven centuries, and helped the city to become a great shipping centre. The total area of the City Docks is now 181 acres, 83 acres being water. The Cabot Tower, a prominent landmark on Brandon Hill, was erected on the four hundredth anniversary of the landing of Cabot on the mainland of North America, and a corresponding tower has been erected at St. John’s, Newfoundland. John Cabot, backed by Bristol merchants, sailed with his sons and eighteen seamen from Bristol in 1497 in the Matthew. He landed in what is now Nova Scotia. The next year he sailed to Newfoundland and south as far as what is now Virginia. This trade route from Bristol to Newfoundland and Nova Scotia is one of the oldest of ocean routes from any port in the world. The wine trade developed rapidly in the sixteenth century when Bristol merchants settled in Lisbon and Oporto, in Portugal. Wood pulp for making paper and artificial silk is an import that has increased in modern times. Bristol has become an important centre of the printing and allied trades. As Bristol has grown with the ship her story is interwoven with that of the sea. Many famous men have dwelt in the city. Richard Hakluyt, author of the Principal Navigations, Voyages, and Discoveries of the English Nation, was at one time a Prebendary of Bristol Cathedral. Daniel Defoe, author of Robinson Crusoe, spent some time in Bristol, where he once fled to hide from his creditors. Alexander Selkirk, the presumed original of Robinson Crusoe, was rescued from the island of Juan Fernandez by Captain Woodes Rogers, who sailed from Bristol with two privateering ships. These are dead and gone, but the Society of Merchant Venturers, which began even before Cabot sailed for America, still exists, and the spirit of enterprise is as vigorous as ever in this thriving port. REINFORCED CONCRETE TRANSIT SHEDS are used for dealing with grain and general cargo at the Eastern Arm of the Royal Edward Dock at Avonmouth. The sheds are 500 feet long and 156 feet wide, with 15,240 square yards for floor space. Alongside is the Mount Hymettus a vessel of 5,820 tons gross, built in 1921 at St. Nazaire, France.